It's about time I get off my lazy rear end and start posting. I have been giving the new waders and boots a workout as I have been scouting the streams for changes and fish since the third week of August. First of all I love the boots. They are lug soles with studs so when you get walking through muck or up muddy banks they really dig in. Thank you Bill Shearer for the advice on this boot. I would still be sitting on the fence about what I should buy if it wasn't for you. I love the toe room too. Back to the fishies. I am sure you all remember the wet rainy summer we had capped off by some very cool nights toward the end of August. Well during my scouting of streams both big and small starting the third week of August; Steelhead showed their pretty little faces in a few of our mid sized and small streams much to my joy and surprise. One morning I nearly shat myself to find 30 steelhead sitting in a hole. Well I did a little fishing back then and caught a few but most of the time was spent observing stream changes and just enjoying my little early season steelhead Easter egg hunt. You never know unless you look I guess. The bummer is that the last few weeks have had warmer temperatures and a lack of rain. The above conditions resulted in the mid sized and small streams drying up to just about nothing and the majority of the steelhead that I previously encountered made their way back to the lake. So best bet is to cast the spoons and spinners at the mouth or heave some streamers out their in the great big blue. The flood waters of August have really done a number on the Big Girl. You know how that goes? Bends where their were no bends;pools where their were no pools, and unfortunately some pools and runs filled right up with gravel and rock. She tends to be murky and chalky most days even with low flows which I would surmise that when it does rain, she is going to stay muddier for longer periods than normal. But as you know we are all at the mercy of the steelhead gods and must play the cards we are dealt every year. Sorry I don't have any great stories or pics right now but it is early and we need precipitation and cooler nights to get things rocking. Glad you like the boots. Best bang for the buck,and good traction as you said. We'll have to see what this rain brings in. hey those boots look awsome where did you get them and what cost? i also am looking for a better pair. 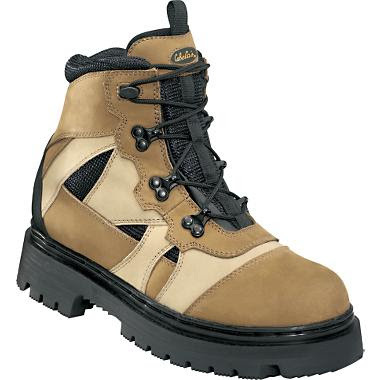 Cabela's Guidewear wading boots. I think they were $99.00 bucks.